KanJam has been a popular game since 2005 when it spike in popularity after being invented in 1980. Since then, KanJam is slowly becoming a household name. Kan Jam is very easy to store with unpacking to a flat plastic board very easy to do and creates a small storage requirement. It’s super easy to learn and so can be played with all ages. This game kicks up your activity a notch as you might find yourself chasing that runaway Frisbee or jumping in the air to smack down your partners Frisbee for extra points. Either way, you will be having a blast with this game. 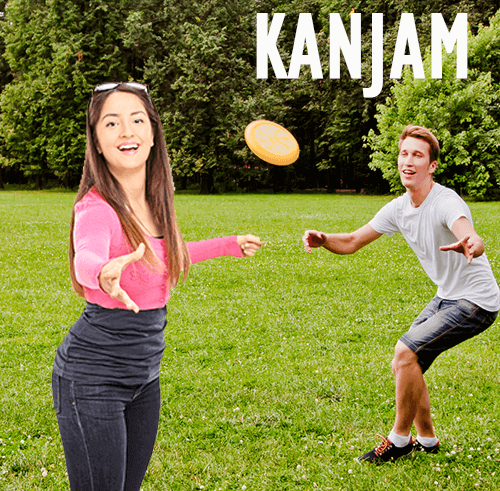 KanJam is an easy advancement to throwing around a Frisbee. Don’t go for that boring old Frisbee, next time reach for your KanJam. KanJam is 2 black circular bins, each bin with a mailslot size in the front, and 2 frisbees. The goal of the game is to get the Frisbee in the mail slot or have your partner hit the Frisbee into the top of the bin. The bin acts as your goal bin for KanJam. We first discovered KanJam at a beach BBQ and this was a perfect game to bring to the beach. Most people had never played KanJam before and before the end of the BBQ almost everyone was either playing or waiting in line to play with a group of spectators. At first, this outdoor game looks awkward and clunky to store but the black bins easily are dissembled and sit as a thin plastic sheet taking up hardly no room at all. It’s a game that is a ton of fun, can be quite active so you get some exercise at the same time, and can spark a lot of fun competition among teams. We would definitely recommend KanJam for your next Backyard BBQ. It was one of the top games that inspired us to start Backyard Games, find it in our Top 5 Backyard Games too. KanJam is a very easy and simple setup. Simply take the 4 plastic sheets and place them together interlocking the puzzle joints in each so they sit securely and make an enclosed circle with open and no ends. Place the bins 50 feet apart and get out the frisbee. 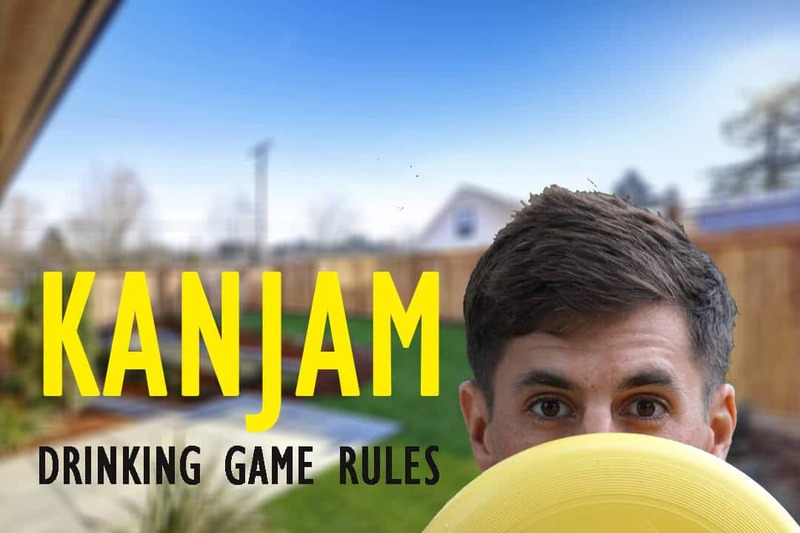 For KanJam rules there are actually a number of different versions out for KanJam, table top KanJam for those rainy days, splash KanJam, there’s even glow in the dark KanJam! KanJam is played with 4 people, 2 people on each team. Each person on the same team stands at a different end so you are standing opposite each other. The first person throws the frisbee as the Thrower, then switch roles and the next person is the thrower before passing the frisbee to the opposing team. Choose which team plays first by quick traditional games like Thumb War, choose a number, or other fun games to see who goes first. Or simply choose up or down, and flip the frisbee to see who goes first. The person who goes 2nd is called the Hammer. It’s considered to be an advantage to be the Hammer team. To play, stand behind the goal line to throw your Frisbee, then throw your Frisbee aiming to have your Frisbee just above the black bin. Your partner standing on the other side of the playing field is the Deflector, and must knock the Frisbee into the pin with their hand. Ideally you want to use a flat palm fro above the Frisbee to control the direction the Frisbee goes in. If you are successful in getting the Frisbee into the mailslot of the front bin you receive an instant win! You must stand behind the goal line, if you do not, your points for that round are not applied. The Frisbee cannot hit or bounce of the ground. The deflector cannot double hit or grab the Frisbee with 2 hands. You can only use 1 hand. If the other team interferes with the Deflectors, 3 points are awarded as penalty to the other team. The winning team must reach the exact score of 21. Each team, completes the same amount of rounds. AKA, if the Hammer team gets to 21 first they win. However if the team that threw first gets to 21, the Hammer team has an opportunity to throw. If the hammer team gets to 21 then it goes to an overtime round. In the event of a tie, there is an overtime round. In the overtime round the team with the most points wins the game. If the score is tied, there is another overtime round until one team wins. The points system for KanJam is pretty simple. If the Thrower throws the Frisbee and hits the Kan, the team receives 2 points. If the Thrower misses the bin, but the Deflector hits the Frisbee and the Frisbee then dings the Kan, that is 1 point. You get a Slam Dunk if the Deflector is able to deflect the Frisbee into the top of the Goal which is 3 points. It’s an Instant win, if the Thrower gets the Frisbee in the mailslot of the goal! In the event of an Instant Win, the other team does not get a redemption throw. Are you ready to play? Click here to Buy Now on Amazon.